Blackjack is one of the most played casino games and as such, a great number of variations have been developed over the years in order to give players the chance to experience a different way of playing it. Some of them grew in popularity so much that many of the casinos nowadays offer them along with the classic Blackjack. Some variations allow players to enjoy their favourite game by placing an additional side bet, whereas others give them the opportunity to make moves and decisions which are restricted in the classic version. With such a huge diversity, the game is always enticing and interesting and it is no wonder why after so many years it is still one of the most searched card games. However, before players give a try one of the variations, they should always take into account not only its specifications but also the casino rules. The reason why, is that some rules can vary depending on the place the game is played at and it is best to make sure they are aware of them in advance, otherwise they significantly increase their chances of losing more money. Atlantic City is a variation of Blackjack which became popular due to its low house edge which gives players moderately good chances of winning, providing that they apply a strategy correctly. It is a very challenging and enticing version which makes it extremely appealing to a huge number of players globally. It is very accessible to enjoy this variation as it is offered by most brick and mortar casinos as well as online. 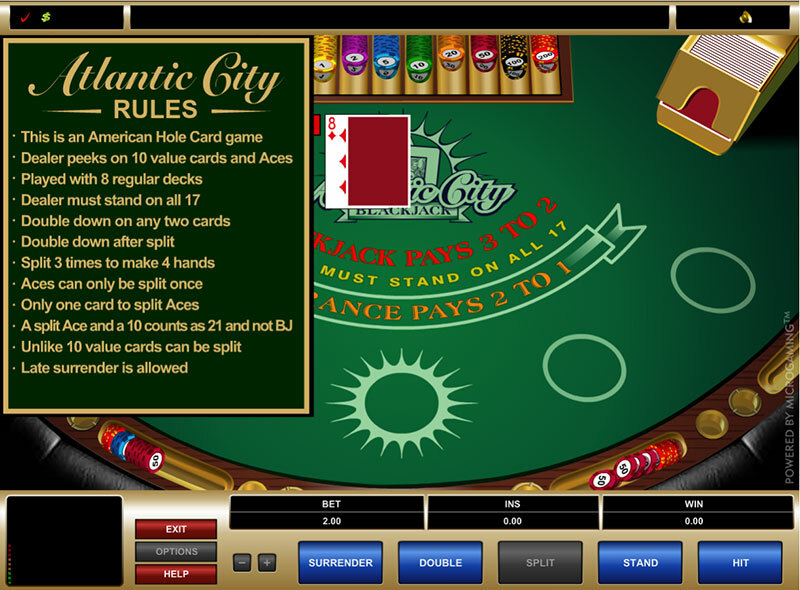 Atlantic City is no different than the rest of the variations in terms that it uses the same main rules and principles as the classic Blackjack. The objective of the game is to reach twenty-one without surpassing it and players compete against the dealer. The cards are valued in the same way as well and the ace remains the most powerful card in the deck. Even though there aren’t many major differences, this version has its specifications and subtleties which is the reason why it is recommended for players to take their time to consider them. Moreover, it is always best to first experience the classic Blackjack and then try some of its variations such as Atlantic City Blackjack. The rules of this version enforce the dealer to stand on soft 17 and also to peek for Blackjack as there is a hole card. Doubling down is allowed on any two cards and also permitted after splitting. Splitting can be done to a maximum of three times but there is a restriction when it comes to splitting a pair of aces as they can be split only once and they receive only one card. Also, a pair of ten-valued cards can be split only on the condition that they are two different cards, such as a queen and a jack. In this version, late surrender is an option which players can take advantage of and insurance is also another available move. In most cases, the payout for Blackjack is standard – 3/2, however players should pay special attention to this rule as there are some casinos which pay differently – 6/5 for instance. The payout plays a crucial role as it determines whether or not they are able to make a profit in the long term and should be always taken into account prior to playing. In order to make sure they will be able to apply their strategy correctly, it is always best to double check the rules in advance. As already mentioned, one of the biggest advantages of the Atlantic City is that its combination of rules work in favour of the players as the house edge is one of the lowest in comparison to the rest of the variations. For instance, a rule which is advantageous for them is that the dealer peeks for Blackjack which prevents them from losing more money by doubling down. Moreover, the variations in which the dealer stands on soft 17 are not many due to the fact that this move benefits the players and whenever they bump into such a version, they should give it a try. Additionally, it is noticeable that Atlantic City doesn’t have any major differences and specifications which make it extremely easy to be grasped and played. It is still recommended to adjust the basic strategy according to the above mentioned criteria, however, this doesn’t require as much time and efforts as some other versions do such as Blackjack Switch. 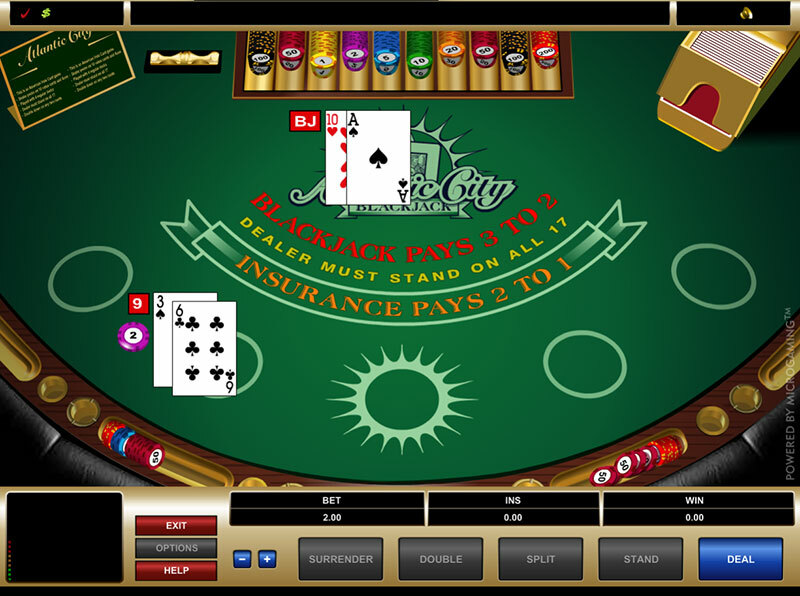 Player is dealt a 9 Hand. Dealer peeks for Blackjack which prevents the Player from losing more money. One thing that can be considered as a drawback is the fact that the game is usually played with eight decks which is not very convenient for card counters. The high number of decks will make the card counting process very difficult to conduct. It is no secret that in order to apply their chosen system correctly they need to be extremely focused which can be a very challenging task to cope with as the casino setting is always full of distractions and temptations. Moreover, as already indicated players should always double check the payout for Blackjack as some casinos tend to change it which can significantly worsen their chances of making a decent profit in the long term. It is always best to search for a table which offers the standard payout of 3/2 as this way they will be able to achieve the desired result. It is extremely important to take this factor into account as it determines whether or not one variation is worth the shot as after all what makes gambling interesting is the possibility to make a profit. Atlantic City is one of the most popular variations of Blackjack due to the fact that it provides players with the opportunity to gain advantage over the casino as the house edge is one of the lowest in comparison to the rest of the versions. It is offered in a number of casinos and it can be also found online as well which is extremely convenient for players who like to play on the go. Prior to playing, it is best to double check the rules of the game as they can vary from one place to another. It is a version which is both interesting and challenging which is the reason why so many players choose to give it a try.